We’re happy to announce we’re launching a new and improved version of our Windows VPN client. We urge all of you to update from the current version (v5) to the new version (v6) as soon as you can, since the new VPN client version comes with many improvements that make the app significantly more convenient to use. 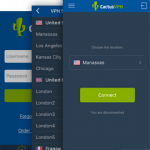 To update, just download the CactusVPN App v6 for Windows and install it. 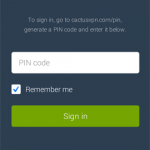 As of version 6, there is a single sign-in screen where you only need to use your CactusVPN account email address and password as credentials. Once you sign in, you get direct access to both our VPN and Smart DNS services. Before, you had two separate sign-in screens for our VPN and Smart DNS services, you had to use your VPN username and password or your assigned Smart DNS key to log in, and you had to use the VPN and Smart DNS services separately. You can now choose which active service you want to use by default. New performance improvements have been made, and we also fixed some bugs (non-threatening). Since the interface of our Windows application has been improved as well, we decided to write up a new tutorial showing you how to install and set up the new CactusVPN client. Just follow this tutorial to get started. If you’d like to learn more about the new or old Windows client version, or just want to ask us about future improvements to our other VPN clients, feel free to drop us a line here or on our social media pages (Facebook and Twitter).